Back to the domestic cup runs, the FA Cup 3rd Round match against Derby County would be useful to gauge their strength before we faced them in the League Cup Semi Finals. Ex-Gunner youth Liam Chilvers was in the side facing us and he squared up with a few known faces in the Arsenal squad. Unfortunately, the Derby defence was torned apart by the rampant Arsenal Youth who chalked up a 4-0 win. Marcus Benson scoring a hat-trick and Junior Elliot scored the other. The League Cup Semi Final match was another matter altogether. John O'Shea scored his first senior Arsenal goal before Noble, Cassano and Calaio added towards the tally. But Derby wasn't going to lie down for us. They scored twice in the last 10 minutes despite being down to 10 men. The second leg ended with 20 minutes of the match being played. Elliott scored the goal before Ian Reed added another to seal our place in the Final against Manchester United who beat West Ham 5-2 on aggregate. Arsenal took on Aston Villa in the FA Cup 4th Round match. 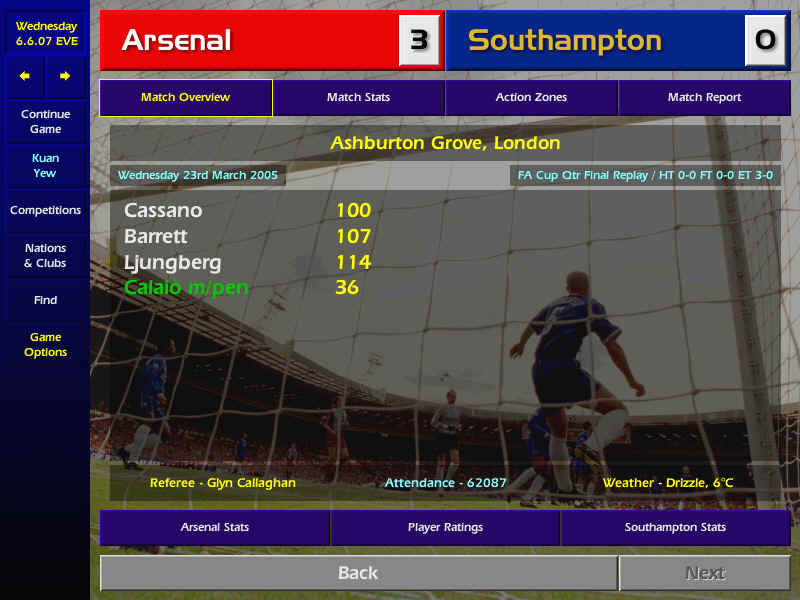 Despite having most of the possession, we could only score a solitary goal through Pennant. 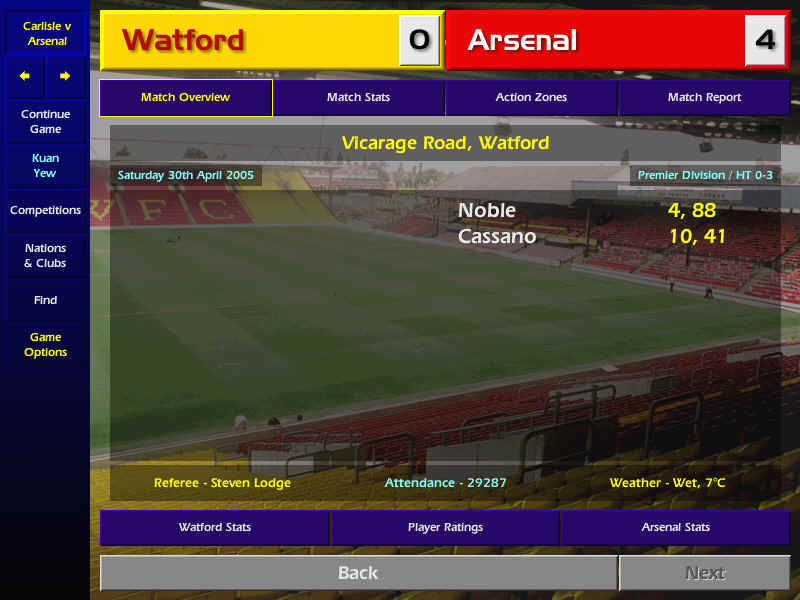 The 5th Round match against Middlesbrough wasn't easy either. Derek Boateg opened the scoring first and it took us until the 75th minute to score. 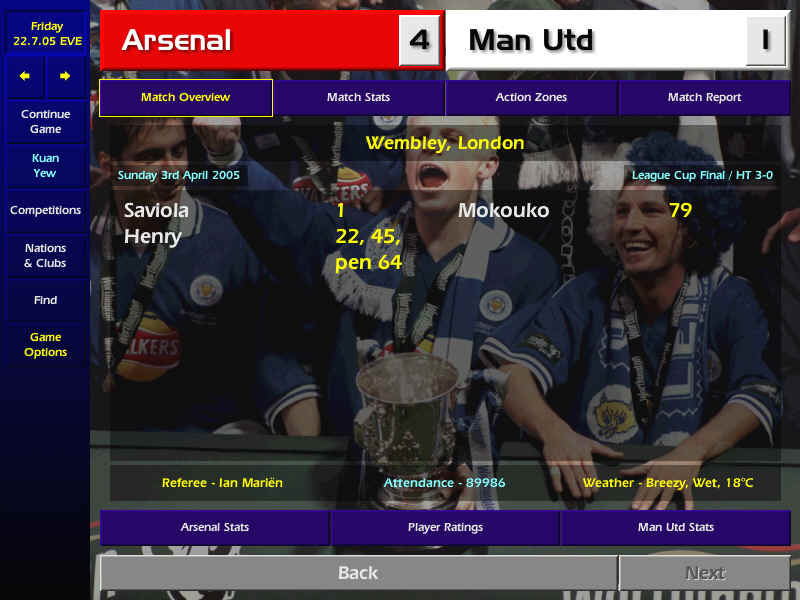 But Saviola didn't let us down, he scored twice within that minute, giving us a 2-1 win over Middlesbrough. The clash between us and this season's title challengers Southampton took place at St Mary's Stadium, home to the Saints. Clint Hill put us ahead after only 2 minutes. But Benayoun equalised for Southampton 5 minutes later after some great footwork by ex-Gunner Lauren. Another ex-Gunner Emmanuel Petit nearly had the ball in the net but was denied by Frey. On the half-hour, Cassano intercepted a weak pass by Lauren and unleashed a shot at goal. GOAL! Southampton seemed eager to preserve the score line at the start of the second half as they defended stoutly against our relentless attacks. Our final breakthrough came in the 59th minute when Greening laid on an inch-perfect pass for Joe Cole. GOAL! The match ended 3-1 in our favour. The resumption of the Champions League saw us taking on Huddersfield twice. Both matches ended in victories, 3-0 at home and 3-1 away. Together with wins over AC Milan (2-1) and Celtic (2-0), we've qualified for the Quarterfinals. The last 8 teams are Ajax Amsterdam, Barcelona, Bayern Munich, Feyenoord, AC Milan, Porto, Spartak Moscow and Arsenal. We were to face Feyenoord again to qualify for the Semi Finals. It would be easy, as we had beaten them before in the Phase 1 group matches. Having qualified for the Quarterfinals, we were up against 2 teams whom we managed to beat significantly earlier this season - Liverpool and Chelsea. Liverpool suffered the same fate as we won 4-2 despite having Patrick Vieira receiving his marching orders in the 79th minute. We were unlucky to draw with Chelsea when they themselves were down to 10 men after Gareth Southgate was sent off. But a late goal by Chris O'Brien gave them a 1-1 draw. With 10 games to go, we are 15 points clear of Southampton. March finally saw Leeds United allowing Sean Allaway to join us for £3.5 million. The agreement came after Allaway rejected their contract offer saying he wants to move to Arsenal. The official press statement showed that Allaway had made up his mind when Arsenal first contacted him back in August but he was denied the chance to speak to us. By doing so, Leeds had denied him a chance to play for Arsenal this season. Our two-leg Quarter Final tie against Feyenoord nearly saw us being kicked out of the competition. I underestimated their team and we came back from Rotterdam with a 1-1 draw. Ruslan Valeev scoring in the final minute. But for the second leg at Ashburton Grove, I had the team ready. 90 minutes later, Arsenal came out tops with a 5-0 win. Saviola and Joe Cole had a brace while Cassano added the fifth. [ScreenShot] That set us up for a Semi Final match against Spartak Moscow. Spartak Moscow was easier and we won both legs 2-1 and 3-1 respectively to qualify for the European Cup Final against Ajax Amsterdam who saw off the challengers from Germany, Bayern Munich, 8-2 on aggregate.